It’s like the first day back at school; everyone’s giggly and getting used to each other again. Then Joey casually starts juggling, and a willowy guy named Jimmy Ava Qamukaq tries out his rusty backflips. Jenny and the also-pretty Nikita Ungalaq fold themselves backward like leggy insects. The rest are climbing on each other – first Reena on Guillaume, then Guillaume on Abraham. Guillaume is strong and lean, his body sculpted by years as a pro circus performer, a guy who, while lying on his back, can lift a person straight up by the bottoms of their feet. Abraham is small and wiry, so he falters a little when Guillaume steps onto his shoulders, ankles to ears. With Guillaume crouched on top, Abraham raises himself until they’re both standing to form a human totem pole. Just watching Guillaume at the centre of all this is exhausting. He doles out attention to everyone equally, in that big-brotherly way that makes even tough guys feel special. The youth are enamored with him. They talk to him like he’s one of them, not, as one performer puts it, “just another white guy from the south.” Unlike the sweep of well-meaning southerners who come here to work, then leave when the experience wears thin, Guillaume has burrowed into old roots. As a kid he spent summers here with his dad, and as an adult, he’s returned – at first intermittently, then full-time since 2005, when he moved to Igloolik to cultivate his budding circus. Since then, Artcirq has taken its show to the world. They’ve attracted glowing press, most of it marvelling at the novelty of these Inuit circus kids. Some of them had never been on a plane, and it’s safe to assume most wouldn’t otherwise have left Igloolik for the wider world, or felt such wider purpose. Since he founded Artcirq nearly a decade ago, Guillaume’s aim has always been to pull young people from the grips of apathy and despair – to “ignite fires,” as he puts it – in a place that has little to offer its youth, where suicides happen yearly. The troupe has never lost anyone, though there have been brothers, sisters, friends. But Guillaume is aware of – perhaps driven by – the possibility that it could. GUILLAUME SALADIN is a towering man with a shaved head and perpetual five-o’clock shadow. Because he’s bald and sometimes wears a long, frizzy goatee, one of Artcirq’s members, Sol Uyarasuk, thought he was “a bad American” the first time he saw him performing on the street. When I first meet Guillaume in Igloolik, he’s smoking on the steps of his shack, wearing a muscle-shirt, jeans and puffy red slippers that look like moonboots. Up close he’s disarmingly handsome, his eyes warm and framed by long, arched brows. Inside, his shack is dim and sweltering. The house is about 50 years old and heated by an equally old oil-stove that’s difficult to regulate. There’s no running water. For a washroom there’s a honeybucket. For furniture there are a couple of ratty couches. For cooking there’s a hotplate, toaster-oven and bar fridge. The walls are decorated with kids’ drawings and sun-bleached clippings about Artcirq. Against one wall is an ailing Kurzweil keyboard, which helps Guillaume unwind when life in Igloolik wears on him. This morning, as with all mornings, he’s waking up to classic Getz/Gilberto jazz and a mug of coffee spiked with Bailey’s. “I like to start the day smoothly,” he says. Guillaume will spend most of it behind his MacBook, where he orchestrates everything Artcirq. There are funding applications to check on, the scheduling of their next shows, and keeping up with global contacts. In the few hours I’m here, he gets an email from Mexico’s Cirko de Mente about a collaboration in January, as well as an invitation from the Inuksuk Association, a non-profit in Paris dedicated to Inuit culture. If you had to choose a place to build a circus from scratch, a remote Arctic community might be your last pick. Getting anything done in Igloolik can be trying. It has the disorganization and sluggishness of the Third World (if you want the keys to the pool, you must track down the guy who knows the guy who has the key), and the opportunism that comes from economic drought (to use someone’s car, you must usually pay an hourly rate). Everything is broken or on the verge of breaking. Every bit of Artcirq – costumes, spotlights, juggling clubs – Guillaume has had to fly in little by little. Getting just half of the troupe on a plane to Mexico can burn up $40,000, or a year’s worth of fundraising. Constantly wrangling money for travel and salaries is not Guillaume’s idea of a good time; he’d rather be circus-training or hunting seals. But agent-slash-manager is a necessary evil, and just one of his many personas. To Artcirq he is part coach, part cool older brother, part pal. Sometimes when he’s with the whole troupe, he doesn’t seem the adult. Not that he isn’t responsible or together, but he lacks a certain hardness or cynicism that tends to develop in one’s 30s. He breaks out in song. He slips easily into his students’ world because, in a way, it’s where he came from. To understand Guillaume and his circus, it helps to understand Igloolik. It sits on a rocky desert butted up against the aquamarine coast of a tiny island off Melville Peninsula. For 4,000 years it was where nomads came to hunt whales and walrus. It became a settlement in the 1960s after the usual wave of outsiders swept through, implanting western gods, commerce and sedentary village life. Today the 1,600-person community holds the distinction of being both strongly attached to Inuit culture (many still hunt, everyone speaks Inuktitut) and, oddly, a media hub. Igloolik made the map in 2001, when local filmmaker Zach Kunuk and his production company, Isuma, won acclaim for Atanarjuat, The Fast Runner, the first feature-film to be written, directed and acted by Inuit. Igloolik has the only video-training centre in the Arctic, and is headquarters for the Nunavut Independent Television Network. Despite the balance of worlds new and old, Igloolik, like many Arctic settlements, can be a boozy, violent place where suicides are common. Young people make up 60 per cent of Igloolik’s population, and lots of them are having babies. Many will drop out of school. Some will fall into petty crime, or worse, an unshakable listlessness. In 1999, after his first year of training, Guillaume and five circus friends flew to Igloolik on their summer break with the idea to stir its young people. They gave workshops in the community hall using salvaged mattresses and a homemade teeterboard – pretty much a giant teeter-totter that launches trainees high enough to perform a backflip. That month in Igloolik it wasn’t uncommon to see someone juggling on the street or playing the accordion on a unicycle. Riding on the success of the summer, the next year everyone returned, this time with the goal of creating and performing a uniquely Arctic circus show. In preparation, Guillaume organized a 10-day hunting trip on the sea ice so his southern circus mates could get a taste of Inuit culture. Artcirq is a fluid group of about 12 core members. Broadly, you could call it an art-based youth group, dabbling in film, music and theatre, but its main thing is circus. They do juggling, clowning, acrobatics, a bit of trapeze, but it’s totally Inuit – the drumming, the throat singing, even the humour. 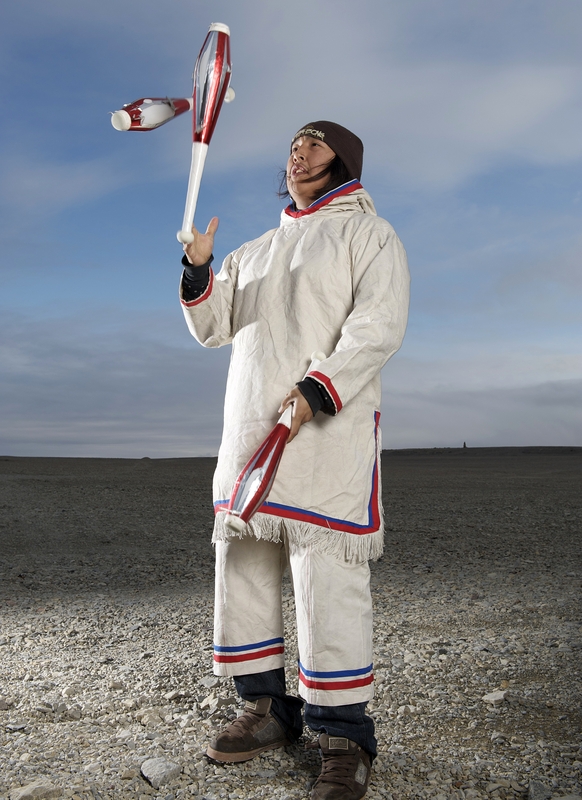 Physically, Inuit seem made for the circus. They are generally short, top-strong, and their joints seem looser, more bendy. As with the circus, life in nomadic times required strength, flexibility and a certain amount of nerve. Artcirq’s latest show, called Oatiaroi (Wait), is an hour-long theatrical arrangement of skits and acrobatics set to acoustic guitar and throat singing. The opening scene is the troupe hunched forward with their arms behind their backs, clucking to imitate seabirds. They suddenly disband, leaving a pile of shiny, white eggs, which become juggling props for the group of girls who are next to file on stage. When they finish their Inuktitut song, the boys wander back and ham it up for the crowd, pretending to drop their juggling clubs and making up for it with flips and goofy stunts. Then the serious juggling begins. Twenty-six-year-old Derek Aqqiaruq, one of Artcirq’s longest-serving members, faces off with Guillaume. They seamlessly toss and catch each others’ clubs, then move shoulder-to-shoulder and merge their clubs, managing to juggle all six in concert. This plainness is embodied in the show’s acrobatics segment – human bodies doing quiet feats. First to start are Jimmy Ava Qamukaq and Guillaume, alone on stage, barefoot and bare-chested. Guillaume pulls Jimmy onto his shoulders in one sweeping motion. They show off their “two-man pack” for a few seconds, then Jimmy grabs Guillaume’s upstretched hands and juts his legs forward in the classic gymnast pose you’d see on a pommel horse. Jimmy is eased to the ground and lifted again, this time by the waist, so he’s hovering above Guillaume’s head like a figure-skater and holding on to his arm with just one hand.